YESS! I am finally the new owner of this analog SLR. I called him ADAM. 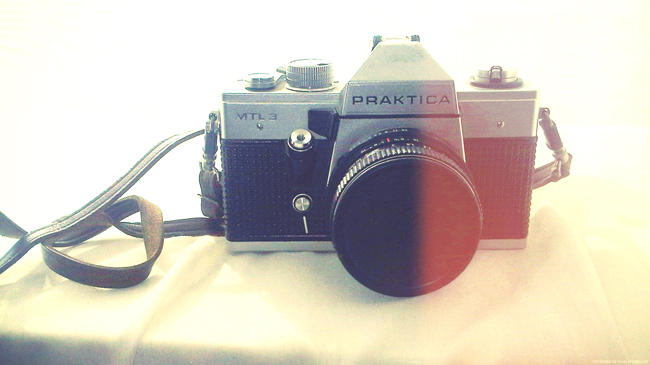 It’s a vintage Praktica MTL3 and was produced somewhere between 1978 and 1984. I found it in the vintage store I regularLy go and it was such a bargain I had to have it. It’s really a great way for me to learn some more about photography and just have fun with shooting images. I hope you like it! Don’t forget to follow me with FacebookGoogle Friend Connect and Bloglovin. I love the pics honey! Can't wait to see the pictures you make with it. LAST WEEK FOR MY MARC BY MARC JACOBS FRIENDSHIP BRACELET GIVEAWAY! I've tagged you in a tagging-article on my blog, please check it out. Would love to see your answers on my questions! I love that type of cameras! Oeh wat gaaf dat je die hebt gevonden! Ik zou er ook graag een willen, gewoon om de nostalgie van het fotorolletje. ADAM IS SOO FREAKING BEAUTIFUL! I know you'll love him so jealous! thank you for the dear comment, I swear I thought I had clicked to follow already 🙁 love it! Totally in love with this camera! Hey, Chris, just a curiosity: what is AMFI? I mean what do you study? I have a secret obsession with vintage cameras. Well, not so secret anymore. What a great find! Amazing camera. I guess the photos are going to be incredible! I'm well jealous. I'm looking forward to seeing your photos from it! How cool is that camera?? I want it too! Such an awesome camera! LOVE vintage cameras so I'm a bit jealous!! They really don't make them like that anymore and it's a shame! Great camera, Vintage camera's zijn echt supergaaf.